An exceptional Japanese style Sumi-e brush art painting; a hand painted reproduction of an elegant, traditional oriental design. Lovely gold leaf appliqué, on an authentically crafted four panel decorative wall screen, with Rosewood stained wood frames and a fine silk fabric brocade border. 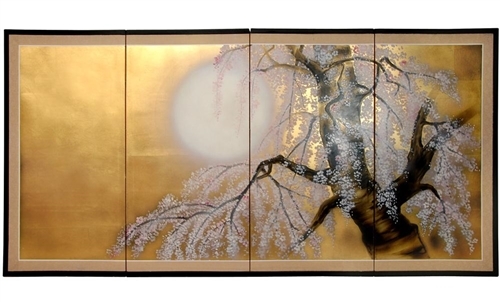 Cherry & Plum blossoms are popular art motifs in Asia, symbolizing the vitality of new life. 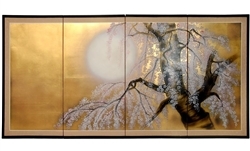 Six foot long, fine quality, authentically crafted oriental decorative wall screen. Elegant gold leaf appliqué, fine silk brocade border, & Rosewood stained wood frame. Beautifully rendered hand painted blossoming tree art motif, symbolic of the vitality of spring.